DayZ Epoch Taviana 2.0 - How? No it does not have to match. If you were to run 2 servers, using the same database, that separates the data. Each row in your database would have an 'instance' field and would have 11. If your other server was Takistan, the instance field would be 1. So when your server retrieves data from the database it requests the data excluding any data that does not match the instance. Those changes are which map we are loading. Whatever map you are running has to be listed, tavi, takistan, chernarus, canadia .. I dont know what other 'classes' call for chernarus that you are talking about. Most likely they are just text displayed for information. Ok, where do we go from here in order to get my Tavi Epoch server run?? BTW, I need a little help on how to post here from PasteBin.com. working, be home in a few hours. i am not sure what is contained in those classes as,far as,chernarus, they are not often edited. probably not a,bad idea, but i didnt do anything and,the server worked. the issue is why is your hiveext not connecting to the running db. why dont you post the relevent files and we will see. it limits,the size of pastes for guests, i have a lifetime pro account. thought i could,create,subusers and add you but not. I've also added an RPT file. The config folder and the mission folder have been zipped. I did notice that the dayz_server.pbo has been modified by FallingSheep in order to get his repack working. But I have tried using the Dayz_Epoch_server (which is the same as the original Tavi_epoch_server pbo) and I got the same error. I will now try to copy over the Pastebin stuff. It may take me a bit. 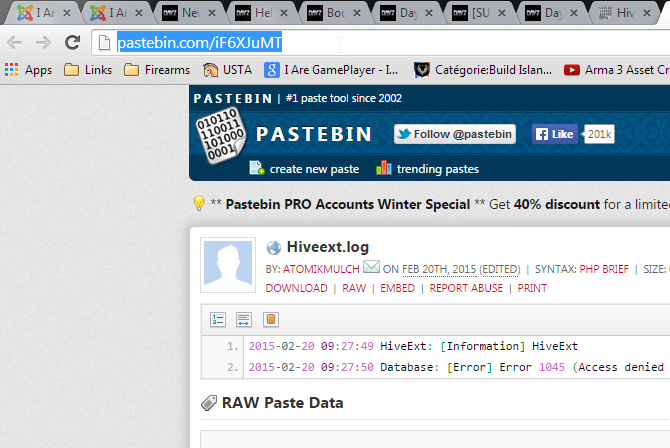 Ok, I've pasted the link for the hiveext.log dump to your account link you just pasted above. Do you see the url in blue at the top of the page. that is what you paste into a forum post here. And I suggest you make an imgur account and use Greenshot, linked to imgur. So you just printscreen, and it posts to imgur and the link is automatically in your clipboard so you just paste the link here..
ROFL. I look forward to the solution video. Was it simple?? Did I make a major booboo? oh well, error in the video. Not going to make another one .. This was your original start script. If you look carefully, your profiles parameter is config\tavi\tavi_11 .. and that is the folder where it will save your user info (atomicmulch), your RPT logs, your hiveext.log AND most importantly this is the folder it loads your hiveext.ini from. Unfortunately, you had your hiveext.ini file in the config\tavi folder which is what we expected because it was trying to connect without your correct user or password. I changed the profiles to save to config\tavi\taviserver because this is LESS confusing when you look at the folders because its not the same name. The profiles folder will contain nothing except your hiveext.ini file initially. When you start the server it will create a user folder which contains your atomicmulch user folder which contains the profile folders where you can specifically edit the difficulty settings of the server. So short story: your current settings you can simply copy hiveext.ini into the config/tavi/tavi11 folder. I preferred to change the location of profile to tavi_server and place the hiveext.ini in there. on second thought ... a much abreviated video .. but I already had the intro and outro scenes in place so it felt like a waste to not post one ..
Ok, I didn't know that the hiveext.ini had to be in that profiles folder. Well I learned something new! yes, those parameters like =name, -profiles are not very well documented. Especially since the hiveext.ini is not part of Arma2, thats a Dayz invention so .. trial and error and error and error usually. Well later tonight will be TAVIANA TIME!!!!!! Ok, I just tried joining the server. Launches beautifully but at one point, the client machine says in the Multiplayer setup screen: "Receiving mission file (0kb/0kb)", and it freezes there. It read the original mission file of 53kb without a problem, so why this?? WHAT? You broke your crystal balls???? Well that answers my question........which will not be posted. But, I will post the RPT file as soon as I get breakfast. Alright, I've launched the server, launched Arma2:OA with the appropriate expansions, joined the server and after 30 minutes of trying to join I cancelled the process. So, what was happening was that the game kept cycling through the "Waiting for server to start authentication" process, over and over and after 10 attempts, I cancelled it. So I had a quick peek at the RPT file, the hive was complaining of ""ERROR: Cannot Sync Character AtomikMulch as no characterID"" and kept disconnecting my player. So here are the RPT and log files. Why is my player being disconnected?? delete your character from the hive and see what happens. github is a good tool, but hard to learn for newbs. But GIST is part of it and you can paste large public files, sign up for an account for free and you can save all your code snippets. so to delete my character from the hive, I must delete the atomikmulch folder found in the taviserver folder?? the taviserver/atomicmulch is your settings, difficulty, saved variables .. so .. no. Start the server so the mysql is running, start mysql workbench and connect to the epoch database. Delete all the rows in the character table ..
First of all, before I delete my character from the hive, will this also delete my character from my ordinary Epoch server?? BTW, have you glued your crystal ball back together? ?